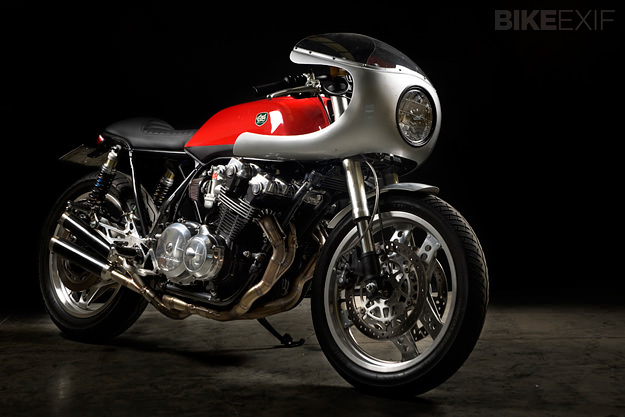 The Honda CB900F was never the prettiest of bikes. 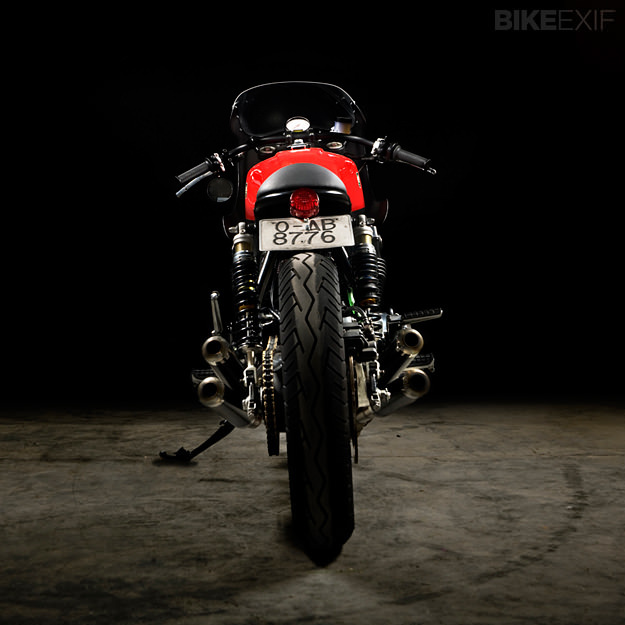 But with a solid 95 bhp on tap, it offered a big performance jump over the CB750. It was mostly aimed at the European market, where it was known as the Bol D’Or—after the famous endurance race. 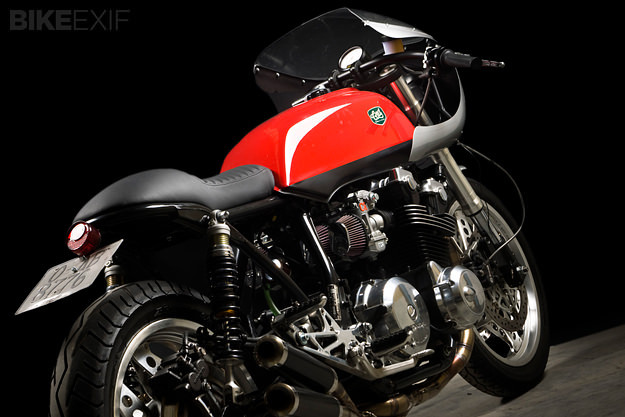 The Spanish shop Cafe Racer Dreams has now revealed the potential of the CB900F with this exquisite custom. It’s been given a hefty upgrade in dynamics, too: as well as the Ducati SS fairing, it’s now sporting the front end from a Monster S2R and assorted Ducati brake components. It’s the personal ride of Pedro ‘Pery’ García, the founder of CRD, and technically the first bike out of the Madrid stable. Being the ‘shop bike,’ it’s been endlessly modified over the past three years—but perfection has now been achieved. The rebuilt engine is hooked up to a sinuous 4-2-1-2-4 exhaust system made by GR, with K&N filtration up front and rejetted Keihin carbs to match. 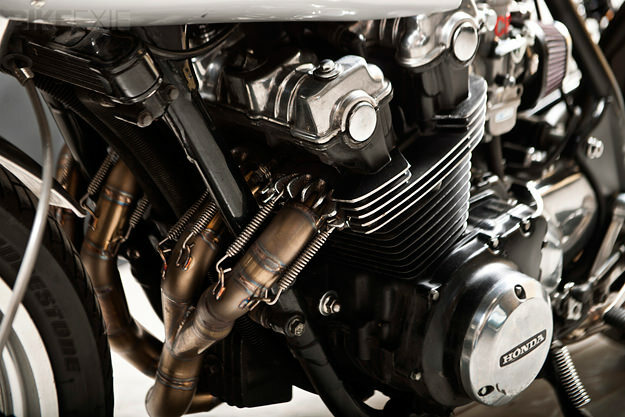 The Tarozzi clip-ons seen on the first incarnation have been replaced by modified Renthal Ultra Low bars, sitting behind a simple Motogadget instrument. 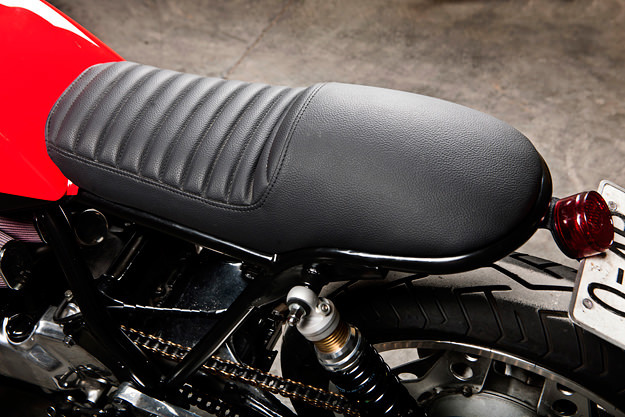 The tank is original, but subtly modified to match the new seat unit, which fits snugly onto a modified rear subframe. The tires are Bridgestone BT45 front and back, fitted to 18″ wheels. 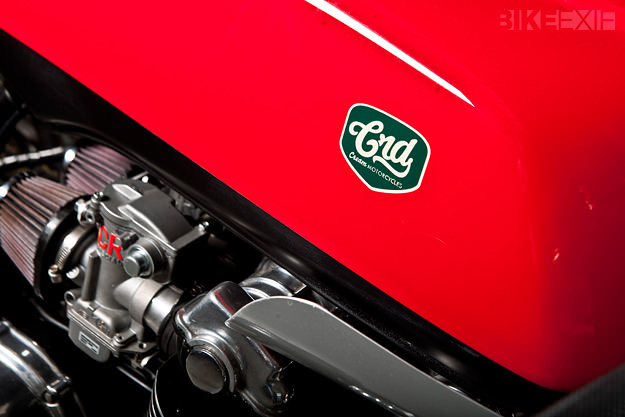 The look is clean and simple, with striking red and silver paint and a classic racer vibe. A concealed battery, now hidden in a box under the swingarm, adds to the minimalist aesthetic. CRD’s order book is now full, with over ten commissions in the works and recent orders from Paris and Germany. They’re not accepting any more work until at least October, but the good news is that this CB900F is for sale. Contact CRD via their website or Facebook page.